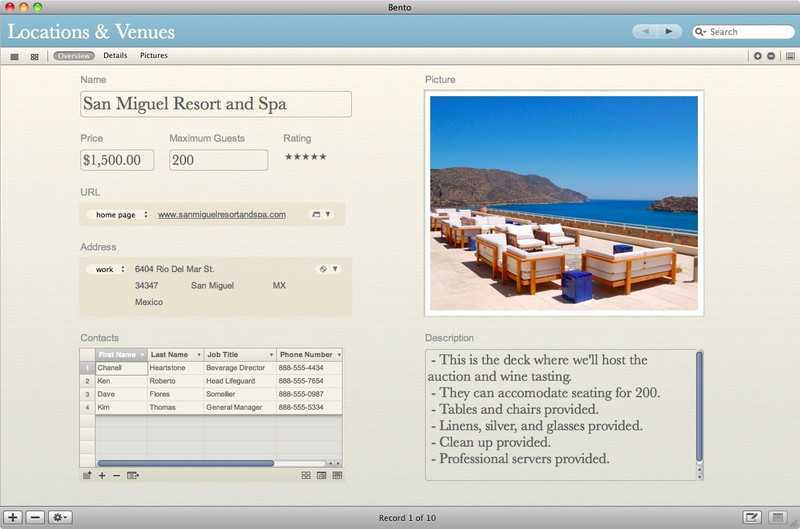 FileMaker Presents the Bento 3 Event Planner, an application that works with the Apple Computer, iPhone and iPad. The Bento 3 Event Planner is a set of six new templates you can customize. Bento 3 makes it easy for Mac users to organize event details all in one place. The Bento 3 Event Planner includes a free 30-day trial of the popular Bento 3 for Mac personal database, plus six professionally designed, ready-to-use templates including Events, Tasks, Expenses & Invoices, Locations & Venues, Contacts, and Vendors. The Bento 3 Event Planner is available today by this free download from the Bento Template Exchange. All six templates in the Bento 3 Event Planner are linked together, allowing information to flow from one template to the next, without the need for repetitive data entry. To organize events on the go, the new Bento 3 Event Planner lets customers synchronize information between their Mac and Apple iPad or iPhone devices running either Bento for iPhone or Bento for iPad, both sold separately. About FileMaker, Inc. FileMaker is the leader in easy-to-use database software. Millions of people, from individuals to some of the world's largest companies, rely on FileMaker software to manage, analyze and share essential information. The company’s products are the FileMaker Pro line - versatile database software for teams and organizations, for Windows, Mac, iPhone, iPad and the web - and Bento, the personal database for Mac, iPhone and iPad. FileMaker, Inc. is a subsidiary of Apple. Copyright © 2010 FileMaker, Inc. All rights reserved. FileMaker and Bento are trademarks of FileMaker, Inc., registered in the U.S. and other countries. All other trademarks are the property of their respective owners. In need of a Plasma TV Rental for your next event? If so then call Rentacomputer.com today at 800-736-8772.